Genetics are a funny thing, aren’t they? I got my dark, thick, naturally curly hair and giant deep set eyes from my 100% Italian father’s side. (I also got the Sicilian temper, which does not serve me well in traffic.) I’ve got the same build as many of the women in my father’s family, as well as some of the characteristics of my 100% Italian maternal grandmother. Three quarters of my DNA is Italian, and I think that’s pretty obvious when you look at me or notice my absolute inability to talk without my hands flying around. 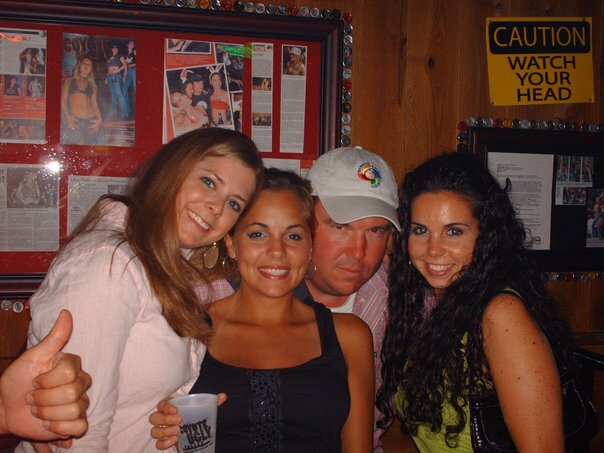 The problem is that I love the look of a tan on me. I feel like with my very dark brown hair, almost-black eyebrows and hazel eyes, I should have darker skin. I think I was meant to have a darker skintone, but there was a glitch. With my hair, brow and eye coloring and the fact that people who look like me often have medium skintones, it only seems right that my skintone is bumped up a few levels. 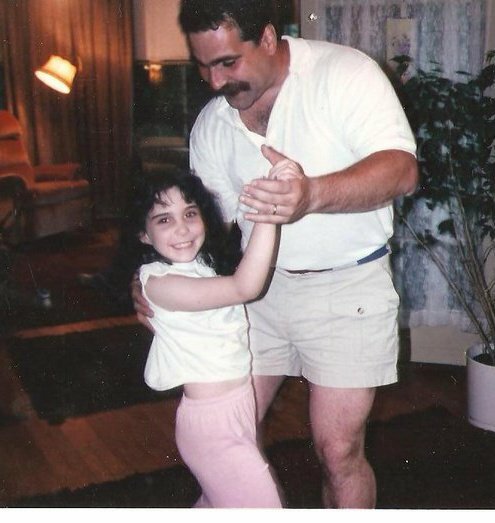 That’s me in the 80s, dancing with my dad. See his skintone? That’s what I was supposed to have. 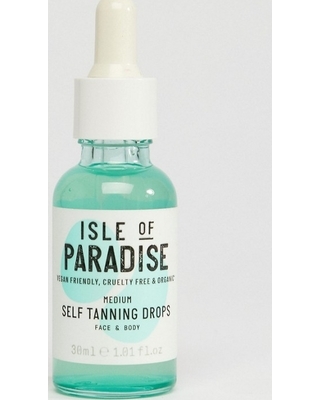 I checked with my friends at the Newport Sephora, and they directed me to the Isle of Paradise Self Tanning Drops. You add these drops into your regular face and/or body moisturizers and they tan you up. They come in Light, Medium and Dark shades. I went with Medium, because that’s the skintone I was meant to have, remember? I’m no fool, so I asked for a sample before committing. I did a patch test of the product behind my left earlobe that same night. (I specifically always patch test there because I normally wear my hair parted on the right side and swept over my left shoulder, so my hair covers my left ear.) I checked the next morning and saw that a) the color had developed into a nice, brown (not orange) tan and b) I had no breakouts or irritation. If you Veronica Lake your hair like I do, you can patch test freely behind your ear. While I was patching, I read through Sephora reviews of these self tanning drops in Medium. I had a bad reaction to the popular self St. Tropez self tanner a couple years ago (after I neglected to patch), and I had the recent breakout from Jergens Natural Glow Face Moisturizer, so I was specifically looking to see if any of the reviews mentioned allergic reactions or breakouts. I figured if I found several reviews mentioning either of those things, I would proceed with caution, but I didn’t see any with that specific negative feedback. Still, I waited 24 hours after patching to make sure I didn’t have a reaction. I didn’t, so on Night 1, I added one drop of the product to my Neutrogena Oil Free Moisturizer and applied it to my face, neck and ears. I noticed a slight smell, but it wasn’t horrible and didn’t linger. It did feel sticky on my skin, but it was also a humid night so that may have had something to do with it. When I woke up the next morning, I was tan. Not orange and not streaky, and a good shade for my skin. I didn’t put face makeup on that day, because I wanted to have plenty of opportunities to inspect it and see if the color developed more (and I think it did, a little). On Night 2, I went with two drops mixed into the same moisturizer and applied it to my face, neck, ears and chest. It deepened my color, but still felt a little sticky. The next time I used it on the same areas, I mixed it in with my SPF35 version of the Neutrogena Oil Free Moisturizer, and then my skin felt only the tiniest bit sticky after. So the moisturizer you mix with the drops definitely impacts the sticky-ness factor. Before I continue, let me explain the drops thing. 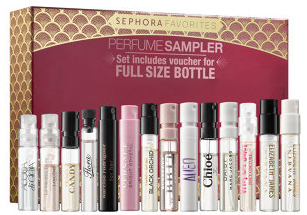 My Sephora sample came in one of the mini-spray bottles that they use for perfume samples. The Isle of Paradise Self Tanning Drops are a serum consistency, so don’t try to spray them out if you get a sample in the same packaging. If you are trying them as a sample–and you really should–and you get them in that bottle, you’ll have to unscrew the top of the packaging and dispense the drops directly from bottle. This method will dispense bigger drops than you get using the dropper that comes with the actual product, so that’s something to keep in mind. When dispensing from the perfume sampler bottle, I recommend you pour it slowly into your moisturizer. I got four uses out of my sample, and I was sold. I went back to Sephora and bought the full size bottle. As far as packaging goes, A+. I like the design, the top stays on securely and the dropper works. No complaints there. Once I had the full size bottle, I began applying the tanner to the rest of my body. I’ve mixed it in with my Palmers Cocoa Butter and my Josie Maran Whipped Argan Oil Butter in Vanilla Apricot, which are the two body moisturizers in my current rotation. Both have their own scent, so that masks any self tanner scent. Again, I haven’t noticed much of a scent anytime I’ve used the drops, but I’ve been self tanning for years, so maybe I don’t smell DHA anymore unless it’s crazy strong. But that’s another reason for you sample it yourself. The Isle of Paradise Self Tanning Drops instructions say to add between 1 – 12 drops to your moisturizer. That’s a huge range! My suggestion is to start with one drop, see how it develops, then add two the next time, three after, and so on until you find your perfect mix. I am currently using four drops to every pump and a half of face moisturizer (which is the normal amount of moisturizer I apply to my face, neck and ears. For my body, I first dispense enough of that moisturizer to cover one arm. Then I add six drops of the product to my moisturizer, mix it together and apply. I match the amount for my other arm. Then do the same amount of moisturizer and five drops of the product to apply to my stomach and back. For my legs, I dispense the amount of moisturizer I would normally use for one leg and foot and add six drops of product. Then I repeat on the other leg. Mix it, mix it real good. Exfoliate First. If exfoliation is not contraindicated with any skincare you are using, a good exfoliation before you apply the self tanner will help it look more even as it develops, as it won’t catch on any dry patches or dead skin. Start Small. Again, start with the minimum amount of drops and add more each day until you achieve the color you want. It’s important to start with the minimum, as the few bad reviews I read seemed to be because the reviewers jumped right in with five or six drops and it sounds like they also didn’t use enough moisturizer. Keep It Up. To maintain the color, I would alternate days of your moisturizer alone with the same amount of drops and moisturizer you used to get the tan. The moisturizer alone with help keep the skin hydrated so the tan doesn’t get patchy as you shed dead skin cells, and the every-other-day application of the self tanner and moisturizer will keep your shade of tan as is so it won’t fade. Mix It Up. You need to realllyyyyy mix the self tanner drops into your moisturizer. If you don’t do that, you will get an uneven tan. After the moisturizer and drops are in the palm of your hand, stir them together with your other hand or rub your hands together for about 15 seconds to ensure they’ve melded into one product. Don’t Be Stingy. Once you have your self tanner moisturizer cocktail ready, make sure you apply a generous amount everywhere. The best way to get streaky is to use only the little that’s left on your hands to apply to an area. When you can feel it dragging as you apply, you are making the streaks happen. I know better, and I still did that one night while using these drops. I dispensed a little less moisturizer then I meant to, so although I evenly covered my face, I didn’t get enough on my neck (and my neck is notoriously bad with self tanner to begin with). I woke up to some patchy areas on my neck where I hadn’t applied enough moisturizer. Did the same thing on one arm too. I think with any type of self tanning lotion, it’s best to use a little more than you think you need to ensure that it gets everywhere. Take Your Time. Spend some time rubbing the cocktail in. I haven’t noticed any transfer on my sheets, even though I usually tan right before bed, and I think that’s because I spend a lot of time rubbing in the product so it really absorbs into my skin. I massage it in until I can’t feel anything on my skin, which usually takes several minutes. But I think it is a key factor in getting an even self tan. The Easiest Part. Wash your hands after applying. This stuff will stain your palms if you don’t. As far as color, the Isle of Paradise Self Tanning Drops give me the same type of color I have when I used to get real tans. Not orange, not olive, not red. Just 24 Year Old Allison tan. I don’t know if the drops react with your body chemistry and give you the type of tan you normally get, or if the color they give happens to be the same color I tan, but they work perfectly on me. I do want to add that I have a very yellow undertone to my skin, which could impact the color. If you are concerned about the color, you could try a bigger swatch of color on your stomach or somewhere that isn’t visible when you have on your everyday clothes to see how the color develops on you. (I realize this can be a tough one for those of you who participate in bathing suit season.) My point is, I can only give you my experience with this color, and that may be impacted by my undertone and the way my skin looks when it really tans. But judged off the many reviews I’ve read and pictures I’ve seen, the Medium shade in particular seems to work on a lot of people. The Medium drops have a green tint, which they claim is color correcting, as green cancels out redness. I don’t typically have any redness in my skin and I’m not convinced you can get color correction from a self tanner, but I can’t say for sure since I didn’t have any redness to start with. So jury is out on the color correction. I really don’t have anything bad to say about this product! As long as I apply it correctly, it gives me exactly the type of tan I want. I am loving the Isle of Paradise Self Tanning Drops and may end up crowning them my Favorite Product of Summer 2018. You can get them at Sephora for a cool $29. Great post! I had not even heard of these drops. I will be heading to Sephora today to get my sample. Thanks! Thanks! I hope you like them as much as I do.